On September 28 in a little corner of Riverside near the railroad tracks, a very special class took place. A handful of homeschoolers got their first introduction to robotics. The children included several former co-op members and Danny and Ricky, current members. 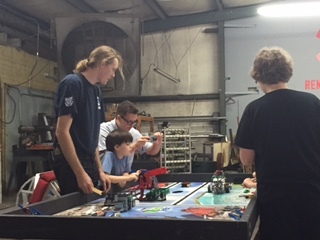 They were attending a homeschool Lego robotics class with Mark McCombs. McCombs, 27, is a graduate of UNF in mechanical engineering. He now runs Renaissance Jax, a non-profit dedicated to STEAM (Science, Technology,Engineering, Art and Math) education of kids and teens. Renaissance Jax organizes First Robotics Lego League (for elementary -aged students) and middle and high school robotics teams and competitions as well. Many local public schools are involved in this effort. McCombs has even received some financial backing from Gary Chartrand From the Florida Board of Education and internships from Vistakon, a contact lens manufacturer, to assist in his effort in the public schools. McCombs’ vision is to put a robotics team in every school in Jacksonville. But McCombs wants to encourage ALL children, not just those in public school,to try to learn all they can about robotics. Which is why he agreed to lead this class. The workshop Danny and Ricky attended was based on the First Robotics Lego League competition for 2015-16, Trash Trek, which involves concepts of recycling and green technology. Since the 9-3 introductory session was not long enough to include designing a robot, the homeschool group worked with pre-designed fully assembled robots. McCombs introduced them to the various tasks in the Trash Trek challenge and had each two-person team program their robot to do one of the tasks. The kids modified their robots and plugged them into a laptop to program them. The software uses a simplified “block” programming system, similar to Scratch, where selecting a single “block” tells the robot to move a certain way. Ricky’s main complaint about the workshop was, “There wasn’t any code!” At 13, he is older than most of the participants and fairly computer savvy. But as the kids advance in age in the robotics program, the code also becomes more advanced. All the kids had to work hard to completely program a task in the time allotted. The kids’ made it through this process of trial and error with creativity and persistance. In the older grades, students may also use skills such as welding and metalworking to fashion the robots themselves. They also graduate from Lego-based machines to actual metal, gears and circuitry. The robotics competitions take place at every level: regionally, statewide, nationally and internationally. UNF in February will be the location of the local First Robotics Lego League Competition. Because of McCombs’ success in growing the program here in Jacksonville, one of the national organizers is scheduled to attend this event. Members of the public are encouraged to come and watch. As if this weren’t enough to keep him busy, McCombs just had a very big weekend. On Saturday, October 24, he had the honor of being one of 13 speakers and four performers at TEDX Jacksonville 2015–Into the Machine. Robotics clubs are valuable training grounds for the engineering and computer experts of tomorrow, McCombs said in his talk Saturday. We need to train children in these skills because there is a deficit looming on the horizon. When Baby Boomers in these jobs retire, there will not be enough highly trained employees in the US take their place. Already, McCombs said, the work is going abroad and we are importing skilled people from other countries. We can keep the jobs here, McCombs said, by showing tech and engineering companies, such as SpaceX, that our kids have the skills necessary to do the jobs. Offering robotics courses in every school is a great way to do that, McCombs said. Teaching our children these skills will mean a strong economy and more tech and engineering jobs in Jacksonville. Have you built yours yet?